I know it's a myth that we only use 10% of our brain, but the point is that we use less than 10% in any given moment; only by using different parts of our brain for various tasks over time do we ultimately use 100%. Let's imagine that we have a GPU, a CPU, a quantum computer, and a biological computer that can work perfectly. It's obvious that some of them are going to be better at performing some things than others, but the point is that anything that can be computed can be done by any of them. I think that similar logic should apply within our brain: Although some areas of the brain might not be too good at processing some things, they could also work towards the result. What is the reason that this doesn't happen? I believe that it would be a significant improvement in the brain's performance, although it would be very energy consuming. , to quote Lennie again. This number, derived for humans, is lower than for other animals, who are capable of sustaining a larger fraction of their brain's neurons simultaneously. This means that rats and hamsters use more of their brains than humans do. Paradoxically, the highest metabolic cost comes from inhibitory activity. Also, neurons restrict their own firing rates via refractory periods. For the best example of a failure of this inhibitory control of excessive spiking, consider epileptic fits, which correspond to extreme synchronization of neural activity, in a sense an over activation of the brain. I think considering that two examples of brains showing more concurrent activity than the healthy human brain are 1. the rat brain, 2. the epileptic brain, it becomes obvious that increasing total activity would not inherently improve brain function. Far from being one single organ performing a single homogeneous function, the brain is actually several lobes, and each lobe is like a separate organ performing a dozen functions. Putting it in another way, the brain is not like a "thinking machine", it is more like a collection of computers, instrument panels of an aircraft, radars and sonars of a submarine, the memory banks and backup systems of the New York Stock Exchange and all the banks on Wall Street, and the automatic self-balancing sensors that make a Segway look feeble, and then some. So, if all the neurons of the all the separate lobes of the brain fire at the same time (which is what 100% brain usage is all about), it means that something is going very, very wrong. Besides, the brain is engineered for redundancy. It is NOT built for firing all at the same time, because some aspects of the brain are like Plan A, Plan B and Plan C; If Plan A fails, it fires Plan B, and if that fails, Plan C. Firing them all at once defeats the purpose of redundancy. Also, some other aspects of the brain may be compared to a multi-stage rocket, where Stage A, B and C fires up sequentially, and not simultaneously. Sequential processing is vital for various brain functions. Unlike a computer, where the circuitry is information agnostic (it can represent anything digital), neural networks (both biological and artificial) are not. The organization of neurons (their connections and the strengths of those connections) determines what they represent and how they process information. Thus, the visual cortex cannot be recruited for audio processing when your eyes are closed because the visual cortex is only capable of the function of processing visual information (very different from a GPU). Thanks to neuroplasticity, the visual cortex can (with much training over a long period of time) actually be recruited for other functions (including audio processing) in blind people for example, but then that becomes the only function it performs - ie, neuroplasticity does not give the brain a context-switching capability like computers have. Neurons are extraordinarily expensive to make, maintain, and use (Laughlin et al, 1998; Stone 2018). Half of a child's energy budget, and a fifth of an adult's budget, is required just to keep the brain ticking over (Sokoloff, 1989; Levy and Baxter, 1996). 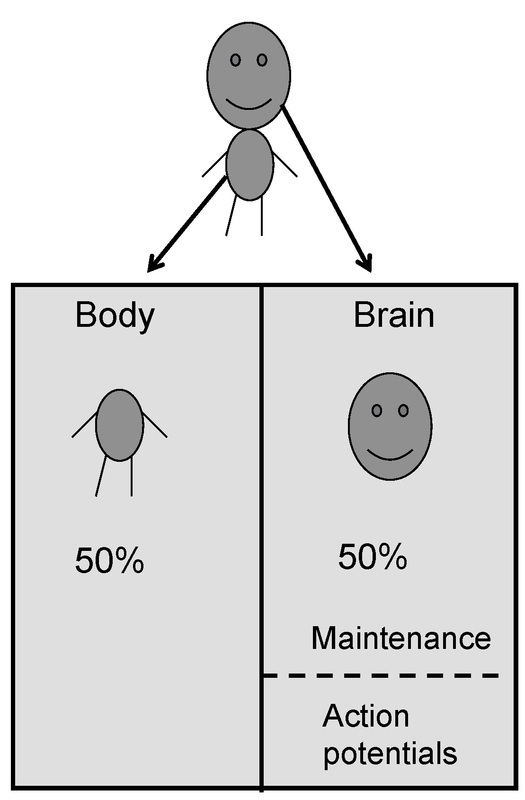 For both children and adults, half the brain's energy budget is used for neuronal information processing, and the rest is used for basic maintenance (Attwell et al, 2001). The high cost of using neurons accounts for the fact that only 2-4\% of them are active at any one time (Lennie, 2003). I suspect that, if all neurons could be active at the same time then the enormous amounts of energy required would probably result in cooking the brain. Attwell, D and Laughlin, SB. An energy budget for signaling in the grey matter of the brain. J Cerebral Blood Flow and Metabolism, 21(10):1133–1145, 2001. Laughlin, SB, de Ruyter van Steveninck, RR, and Anderson, JC. The metabolic cost of neural information. Nature Neuroscience, 1(1):36–41, 1998. Lennie, P. The cost of cortical computation. Current Biology, 13:493–497, 2003. Levy, WB and Baxter, RA. Energy efficient neural codes. Neural Computation, 8(3):531–543, 1996. Sokoloff, L. Circulation and energy metabolism of the brain. Basic Neurochemistry, 2:338–413, 1989. Stone, JV. Principles of Neural Information Theory: Computational Neuroscience and Metabolic Efficiency. Sebtel Press (published 8th June 2018). I think the problem with your question is that we don't "use" our brain. It appears that our brain have different patterns of activities, in different regions, at different times and, to the best of our knowledge, all this factors are what produce our perception of the environment, the reaction we have, and probably our thougths and identity (the "we" in your question). Since their is no "we" outside of the brain that can decide to activate or not any given region of the brain, their is not really an asnwer to your question. Now your question could be reformulated to : "why is the brain not activated at 100% at any given time"
By activation, we usualy talk about action potentials, wich are produced by neurons. This is considered to be the fundamental way of two neurons to transmit information to one another. You can consider this action potentials as a binary code (although it is probably more complicated, see neuromodulation for exemple). In this exemple, an action potential is a 1 and no action potential is a 0. If no neurons are firing, you only have 0, wich convey no information to other neurons (indeed, you can simplify this signal to 0 x the time elapsed). On the other hand, if every neurons are firing in the same time, you don't convey information too (this can be simplified by 1 x the time elapsed). The only way to convey information, and as you might have understood I am talking in an information theory way, is to produce a mix between zero and 1, wich is, in our exemple a serie of action potentials and no action potentials. In you exemple, it would be like if in a CPU, every transistors were activated in the same time. You don't have any information conveyed. An other exemple can be an assembly of persons in a room. If nobody talk, there is obviously no information conveyed. But if everyone is talking at the same time, they don't understand each other. In the brain, an activation of every neurons can happen in certain regions. It is called epilepsy, and it is not really functional. So 100% activation is possible in the brain, but it is not efficient computationaly, as it does not produce information. Not the answer you're looking for? Browse other questions tagged neuroscience neural-network performance brain or ask your own question. How many possible states does a brain have? Is there any way to calculate the cumulative width of synaptic clefts? Brain Right hemisphere is random and left hemisphere is linear? really? How will brain-computer interfacing work? Why our brain can't fool itself to constantly produce dopamine? How is the brain cooled? Could we develop a notion of conceivability that would allow us to imagine impossible/inconsistent/illogical things? What does “The brain has its own language for testing the structure and consistency of the world.” refer to?